In the passwords, card suits are represented by 'C' for clubs, 'H' for hearts, 'S' for spades and 'D' for diamonds. Disney's number one animated star, Mickey Mouse. can produce. Get 'em and judge for yourself. One of the greatest Disney games released! This, Quackshot, Toy Story and Aladdin were the best of a (rather poor, admittedly) sizable bunch. I still think that the level with all the cogs is way creepy though! This game seems fun for the first few levels, but halfway through one of them I actually got to the stage of thinking "what's the pont?" and turned it off. Therefore I have to respect this game because it is the ONLY game ever to inspire nihilism in me whilst playing! when you hear about a disney game you just want to turn a blind eye to them but this one is good VERY good, its addictive gameplay nice graphics and colours and save the damsel in distress plot make a good game. 9/10 well worth sitting down and playing i reccomend getting the disney double pack with quackshot. I HATE THIS GAME! ITS TOO TUFF AND TOO BORING!! THIS IS THE ONLY SEGA GAME I CAN SAY I HATE! 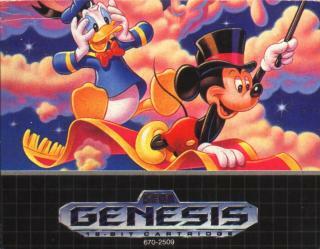 One of the best Mickey mouse games out their! Its magical. Spooky and fun and thats all thats important! 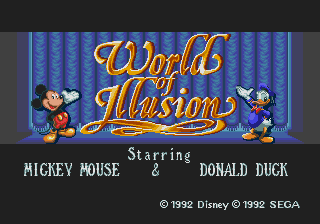 World Of Illusion looks fabulous, is full of great ideas and everyone will have a great time playing it. The only thing missing is some kind of challenge for anyone used to playing games. Although it is superb, it is definitely one for the less experienced players out there! While Castle of Illusion is a pretty but somewhat shallow platformer, World of Illusion is a very pretty but somewhat shallow platformer... uhuh. The graphics in WOI are georgous, bright colouful and full of life, the animation of the main characters is great, clearly drawing from personalities of two of Disney's biggest stars. The game is simple in the extreme, challenging only the youngest (or most inept) players. The two player game is where it's at here, in which through good level design, co-operation between players is often needed to progress. 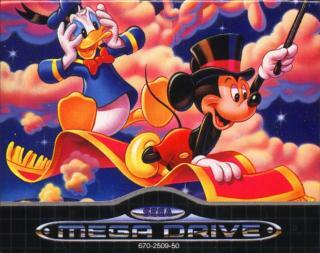 The two player game also features different levels from the single player (as well as different levels for Mickey & Donald). Just on a side note, I have to mention Mickey Mania, if only for its great concept (stages based on Mickeys main features/films) and fantatistic graphics & effects. The game aint half-bad either! 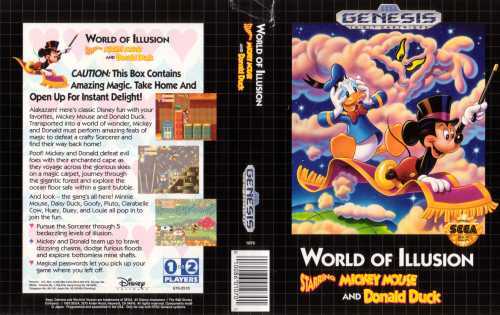 World of illusion is the first and best game I ever bought for the Genesis. Wonderful music, graphics and gameplay. A must for a collection. I don't care if it's Mickey bloody Mouse, this game is just plain unfair. Those moving platforms have a life of their own, and I have no idea if I'm supposed to land on that thing.....oh, no I'm not. I've just died. Again. Harder than five hundred nails welded together and toughened with some fibrous, gelatenous goo. No fun to be had here, and the music is just dire! Avoid. Castle of Illusion was challenging for the time and still isn't a complete pushover, and Fantasia remains challenging thanks to the unique way the foreground obscures a number of platforms, pits, etc. 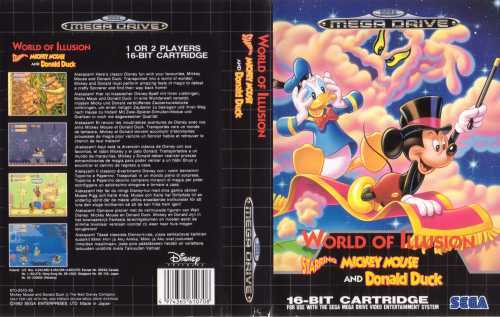 The only real easy Mickey Mouse game is World of Illusion, which is just too dumbed down aside from the rapids level with Donald Duck. 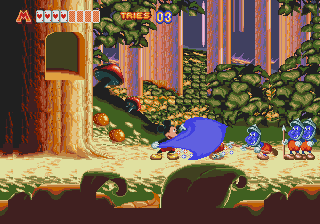 WoI has probably the best Disney game end boss (second best would be the queen in CoI), but he's just so easy it cheapens the battle. Mickey looked cute, but Sonic looked cuter. now this game is a different beast from castle of illusion a better beast infact, this game blew me away the graphics the gameplay the levels just everything about this game is great not to mention the the very involved co-op play.